These are mostly closed-loop, land-based farms that are able to re-use water and can recycle waste too. Well-designed farms can run with no antibiotics or other drugs or chemicals and use renewable energy. Recirculating farms can grow fish and vegetables, flowers, fruits, herbs and more. These farms do not need to be connected to any natural waters, and can therefore grow a wide range of products without the threat of releasing them into the wild, or creating competition with fishermen who make their living selling popular local fish. Recirculating farms are scalable — they can be as compact as a desktop, for personal use, or larger for commercial operation. Being contained, and therefore cleaner, allows these farms to be located near markets and even in communities far from water that will ultimately use the products. Having more farms in each community cuts down on use of fuel for transport and gives consumers fresher food. Check out our pictures on Facebookand videos to see these farms in action. The Recirculating Farms Coalition is committed to building sustainable, local and affordable sources of fresh food by promoting development of farms that use clean, recycled water as the basis to grow food — those that grow plants (hydroponics), those that grow fish (aquaculture), and those that grow a combination of plants and fish (aquaponics). The following are guiding principles supported and designed by our members to help establish model standards for sustainable recirculating farms. The topics listed below are not in order of significance. Recirculating farms reuse most of the water in the system. Wastes are removed; water is filtered and then recycled throughout the farm. 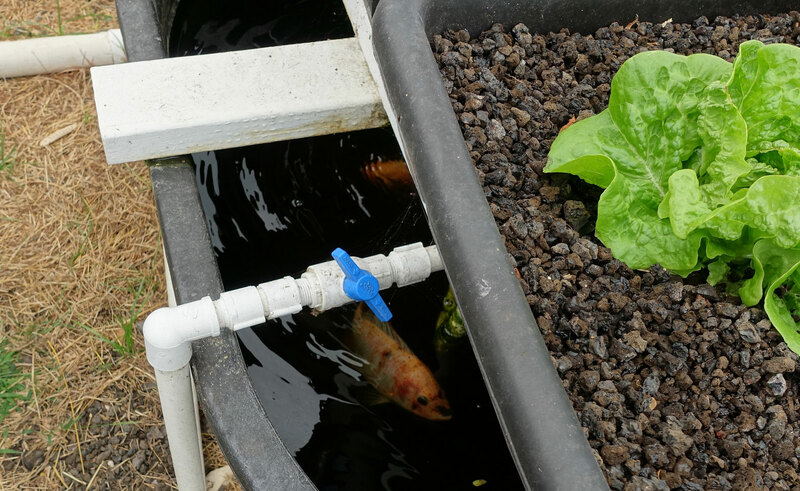 Some farms practice aquaponics — they grow plants and fish together. This increases the efficiency of water usage by producing a wide variety of plants — vegetables, herbs, fruits and more, plus seafood. Ideally, recirculating farms only replace very small percentages of the total water volume, due to some loss during waste removal and/or evaporation. Some farms already achieve a less than 1% daily water replacement. Goal: At least 90% of the water should be recaptured and re-used in each farm. Recirculating farms require varying amounts of energy to move water through the system and support plants and/or fish. Research continues to promote using the least amount of energy with maximum results. Many farms use wind, solar and geothermal power. Other innovative ideas include collecting waste from the farm and converting it into methane gas that can then run a generator to help power the farm, or collecting used oil from restaurants and re-purposing it as fuel for a furnace. Some farms partner with other operations to share energy and reduce consumption while boosting efficiency. Goal: Farms should use alternative and renewable energy sources and/or partner with other existing facilities to minimize energy use and maximize function. Recirculating farms should be closed loop, meaning they are mostly biosecure — it’s less likely that contaminants can get into the farm, and fish, plants and waste are contained. Keeping the farms biosecure helps to protect the environment. And, because parasites and infections have a harder time getting in, the farms can run without antibiotics or other drugs and chemicals, providing a more natural product for consumers. An additional benefit of closed systems is that waste can be captured and in some cases re-purposed as fertilizer or other uses. Goal: Key features of a sustainable farm should be that they are on-land and a closed-loop system that captures and recycles or treats the waste that is generated. Recirculating farms can be located almost anywhere when they are closed loop, scalable, eco-friendly and efficient. These farms can produce plants and fish year round, and take up less space than other forms of agriculture and fish farming. Because these farms do not rely on natural water bodies to source water or provide drainage, they can be located within the communities that use the products — even in-land and urban areas. This empowers communities to source their own food, reduces fuel needs for transportation and provides fresher food for consumers. Goal: The design and placement of recirculating farms could include backyards, abandoned buildings and other types of vacated land to promote local food production in spaces that might otherwise be forgotten. Recirculating farms are mostly closed loop — so a wide range of fish and plants can be grown without concerns about their escaping into the natural environment and harming the ecosystem. That also means that seafood products from recirculating farms need not compete with local fishermen who make their living selling popular fish from the area, because other types of fish can be raised in the closed-loop system. Also, because it is harder for contaminants to get into the closed system, it is easier for recirculating farms to run without antibiotics and other drugs or chemicals. Some recirculating farms have met United States Department of Agriculture standards so their plants can be labeled organic. Recirculating farms can have faster growth rates and use space more efficiently than other farms — so there is no need to grow genetically modified fish or plants to enhance production. Recirculating farms can provide local, natural products to consumers. Goal: Recirculating farms can be a source of natural foods — grown without antibiotics and other drugs or chemicals and not genetically modified. Ideal stocking densities are complex to determine, comprised of both physiological and behavioral needs of each specific type of fish. With some fish, in particular those that school, lower densities may actually be harmful to the individuals, due to increased stress of being exposed to a more open environment. Such fish will fair better in higher stocking densities to mimic natural schooling behavior. Fish that are more territorial may require lower stocking densities to reduce aggressive behavior. Goal: The recommended stocking range should be determined based on the individual needs of each type of fish to be grown in the farm. Traditionally, large amounts of wild fish are used in feed for farmed fish. Removing massive amounts of prey fish from the ocean to feed farmed fish can disrupt ocean food chains and deplete an important source of protein for many already food insecure people around the world who rely on small ocean fish to eat. Research is ongoing at various recirculating farms to improve fish food, including reducing the amount of wild fish used in feed; finding alternative feed ingredients that are healthy and natural (like worms and algae) and even re-purposing waste to create a food source for those fish that would naturally eat such products in the wild. Goal: The feed conversion ratio should be one pound or less of wild fish to raise one pound of farmed fish. Water quality, stocking density levels, monitoring, handling and slaughter techniques are all important factors for humane treatment of fish. Water quality values vary depending on the type of fish, but farms should always include monitoring and adjusting of dissolved oxygen, metabolic waste (solid waste, ammonia, nitrite and nitrate), pH and temperature to reach the proper values for the fish being raised. Handling and transport should be kept to a minimum. When handling and transport are necessary, measures should be taken to reduce stress on the fish. The proper nets, gloves and buckets should be used to prevent removal or irritation of the mucus coat and/or scales that protect the fish. Adequate water circulation, maintenance of dissolved oxygen levels and waste removal are all key in transport situations. Steps should be taken to ensure the fish are slaughtered quickly, with minimal pain and stress. Air exposure should be brief. Goal: Recirculating farms should maintain proper water quality and stocking density for the type of fish being raised, regularly monitor the fish, minimize handling, maintain low stress levels and practice humane slaughter techniques.